Home Brew Beer: September 2008 Fermentation Friday! "What indigenous brewing ingredient have you used or would you like to brew with and what style would that beer be?" Now don't get this confused with the short list of bad ideas I came up with in a previous edition of Fermentation Friday, when the question of the month was, "What is the craziest concoction you ever came up with, on the fly or prepped, to brew with." I'm glad Marcus from Final Gravity, this month's host, included the words "or would you like to brew with" as I have not yet brewed with anything overly unique or interesting, indigenous or otherwise. For me, it would have to be either apples or pumpkins. There's not much else I can think of besides those two items, unless someone knows how to make a tobacco beer, but I hate tobacco. And I think out of the two, I would lean more towards pumpkins. I'm not big on overly sweet beers and ciders. That being said, I'm not overly in love with pumpkin ales either. Last Friday, at the Hartford Better Beer Fest, Kenn and I got a chance to try Southern Tier's Pumpkin Ale, AKA Pumking, and it was, "Very nice! The pumpkin was surprisingly subtle, but would go well with this Thanksgiving's feast." Or at least that's what I thought at the time and that's what my chicken scratch tasting notes said. From what I've heard, many pumpkin ales are merely ales with traditional pumpkin pie seasoning added. 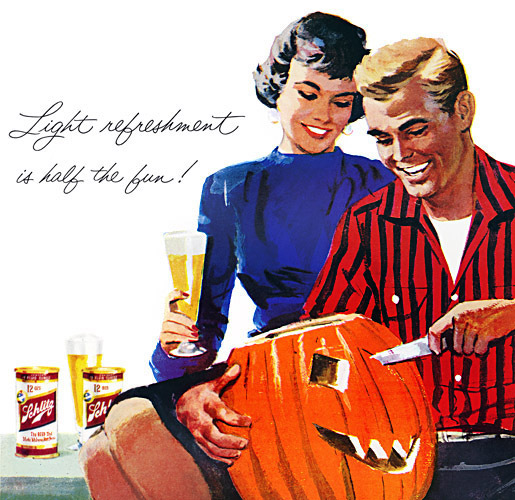 That's OK and all, but I really want to go out, pick a pumpkin and turn it into a big bottle of beer. According to Kenn, he read something about the colonial New Englanders who would be forced to use pumpkins for beer making due to a lack of other more typical fermentables. He also mentioned something about boiling it to make beer, and have enough left to make soup or pie, I blieve he said. Now that would be cool! Kenn, what was that book title again??? Had I more time this fall, I would give this a whirl, but sadly this season is short on free time. Perhaps next year Kenn and I will follow in the foot steps of those intrepid colonist and do a joint endeavour, diving head first into pumpkin brewing, and perhaps even a little cooking if enough of the old jack-o-lantern survives the boil... Stay tuned!